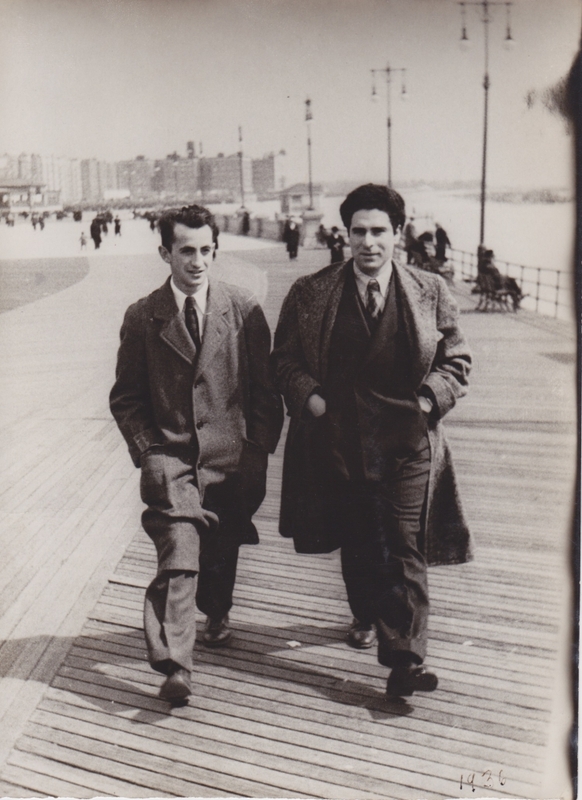 Chaim Gross (at right) with a friend in Coney Island, New York, 1936. Chaim Gross (1904-1991) was a modern American sculptor working in New York City from 1921 until his death in 1991. He was born in 1904 to a Jewish family in Austrian Galicia, in the village of Wolowa in the Carpathian Mountains. In 1911, his family moved to Kolomyia. During World War I, Russian forces invaded Austria-Hungary; amidst the turmoil, the Grosses fled Kolomyia. They returned when Austria retook the town in 1915, refugees of the war. When World War I ended, Gross and brother Avrom-Leib went to Budapest, where Gross attended the city's art academy and studied with painter Béla Uitz, though within a year a new regime under Miklos Horthy took over and attempted to expel all Jews and foreigners from the country. After being deported from Hungary, Gross began art studies at the Kunstgewerbeschule in Vienna shortly before emigrating to New York City in 1921. In New York City, Gross's studies continued at the Educational Alliance Art School on the Lower East Side, led by Russian-American etcher Abbo Ostrowsky. Gross first began to exhibit his work as a student at the Alliance in 1922 (in the late 1920s, he joined their faculty). Gross also attended the Beaux-Arts Institute of Design from 1922-25, where he studied sculpture with Elie Nadelman and others, and at the Art Students League in 1926, with sculptor Robert Laurent. In 1926, Gross began to exhibit his sculpture at the Jewish Art Center (then in the Bronx), and in 1927, at the Salons of America exhibitions at the Anderson Galleries at 59th Street and Park Avenue. Beginning in 1928, he exhibited at the Whitney Studio Club at 10 West 8th Street (the precursor to the Whitney Museum of American Art), showing a watercolor "Circus" in their 13th Annual Exhibition of Paintings. In March 1932 Gross had his first solo exhibition of sculpture at Gallery 144 in New York City. Also in 1932, Gross married Renee Nechin (1909-2005), and they had two children, Yehuda and Mimi (Mimi Gross is a New York-based artist, and was married to the artist Red Grooms from 1963-1976). In 1933, Gross joined the government's PWAP (Public Works of Art Project), which transitioned into the WPA (Works Progress Administration). Under these programs Gross taught and demonstrated art, made sculptures for schools and public colleges, and created works for Federal buildings including the Federal Trade Commission Building, and for the France Overseas and Finnish Buildings at the 1939 New York World's Fair. Gross was also recognized during these years with a silver medal at the 1937 Exposition universelle in Paris. Chaim Gross, Sculptor by Josef Vincent Lombardo, the first major book on Gross, came out in 1949 and included a catalogue raisonne of his sculpture. In the 1950s Gross began to make more bronze sculptures alongside his wood and stone pieces, and in 1957 and 1959 he traveled to Rome to work with famed bronze foundries including the Nicci foundry. In 1959, a survey of Gross's sculpture in wood, stone, and bronze was featured in the exhibit Four American Expressionists curated by Lloyd Goodrich at the Whitney Museum of American Art, with work by Abraham Rattner, Doris Caesar, and Karl Knaths. In 1963, Gross and his family moved from their longtime residence at 30 W. 105th Street to Greenwich Village, following the purchase of a four-story historic townhouse at 526 LaGuardia Place, which is now the Renee & Chaim Gross Foundation. In the ten years from 1974-84, a number of key events related to Gross's life and legacy took place. In 1974, the Washington D.C. art critic Frank Getlein published an Abrams monograph entitled Chaim Gross; the Smithsonian American Art Museum held the exhibition, Chaim Gross: Sculpture and Drawings; and the Renee & Chaim Gross Foundation was created. In 1976, a selection from Gross's important collection of historic African sculpture, formed since the late 1930s, was exhibited at the Worcester Art Museum in The Sculptor's Eye: The African Art Collection of Mr. and Mrs. Chaim Gross. In 1977, Gross had three retrospective exhibitions: at the Lowe Art Museum at the University of Miami, followed by the Montclair Art Museum; and at the Jewish Museum in New York City, for which scholar Roberta Tarbell wrote a key essay on Gross (read Tarbell's essay here). In 1980, the Austro-American art historian Alfred Werner published the major monograph, Chaim Gross: Watercolors and Drawings. In 1984, Gross was inducted into the American Academy of Arts and Letters, with Jacob Lawrence and Lukas Foss. Gross passed away at Beth Israel Hospital in May 1991. He was buried at Mount Lebanon Cemetery in Queens, New York. In the fall of 1991, Allen Ginsberg gave an important tribute to Gross at the American Academy of Arts and Letters, which is published in their Proceedings.